TIWAL 2 & 5.60 M² ROLLABLE SAIL. 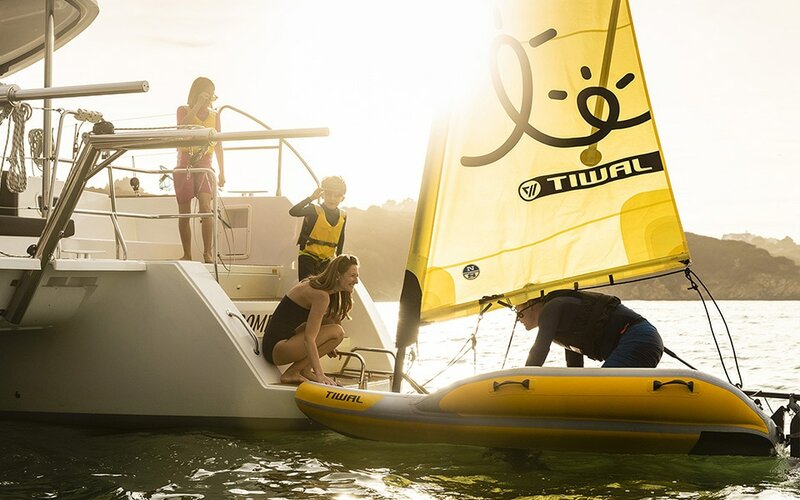 Carried on your cruising boat, the inflatable Tiwal 2 sailing dinghy will transform your anchorage experience. Want to get some fresh air alone and enjoy planing in a rising breeze? 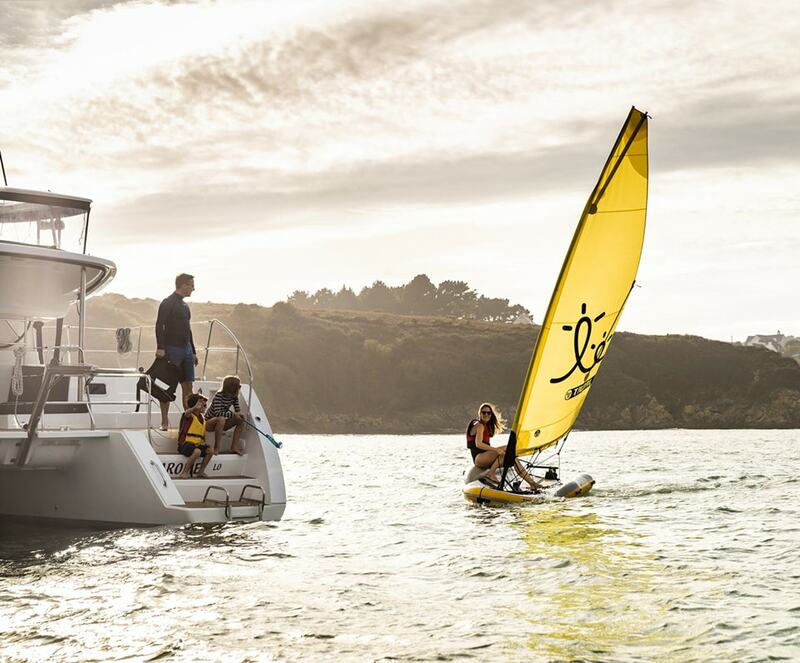 Do you want to go with your child to share special times together on the water? Want to explore the coves around you? 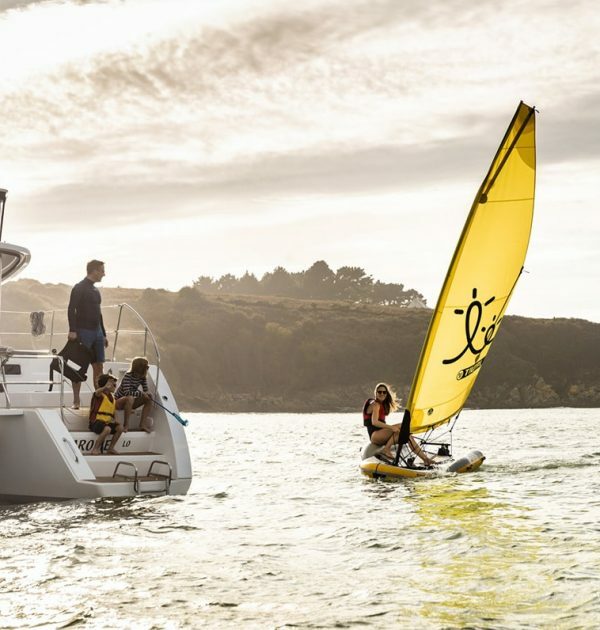 Do you want to impart the pleasures of sailing to your young crew? Come with us, we’ll take you on a Tiwal 2. 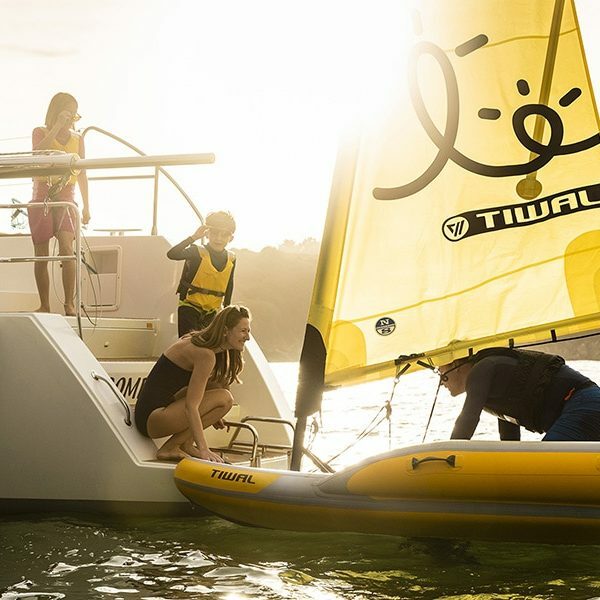 The Tiwal 2 is a small inflatable sailboat. It is designed to be carried on a cruising boat. Light in weight, at just 40 kg, it fits in two easy-to-store bags. Its assembly is very fast: 15 minutes maximum. 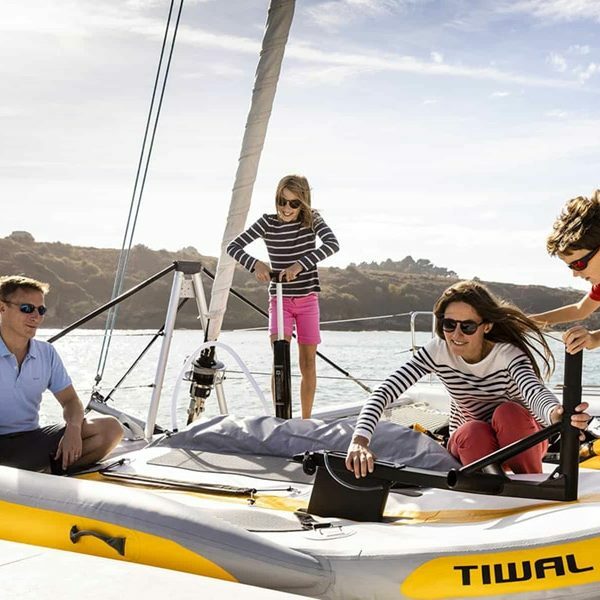 For single-handed sailing or with a child, the Tiwal 2 is a delight for the whole crew, young and old alike. 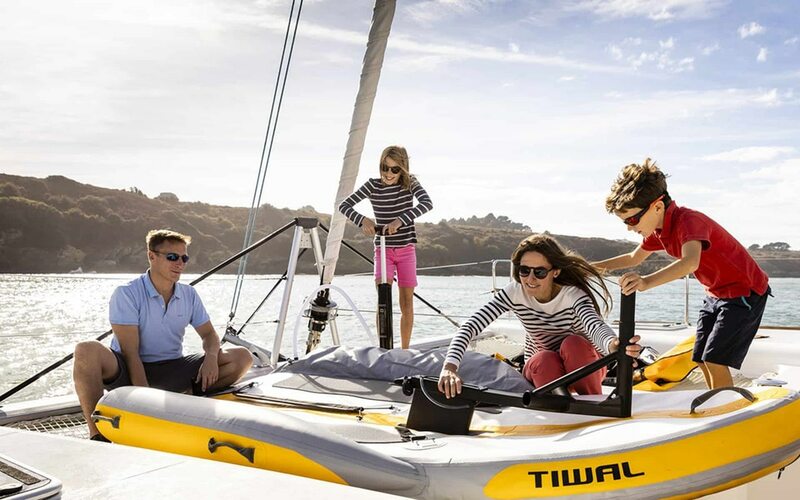 With the Tiwal 2 you’ll want to stay in the anchorage! 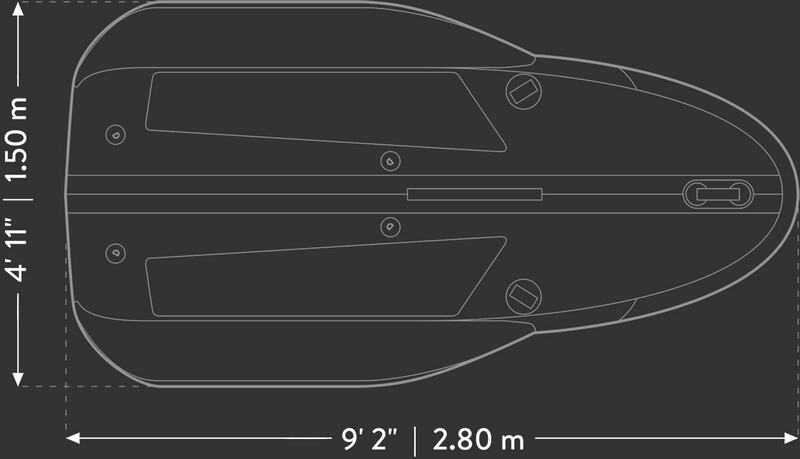 The Tiwal’s inflatable hull consists of a high-pressure Drop Stitch central compartment and two wing-shaped compartments on each side. The central part has a V-shaped hull and a round scow-shaped bow. An anodized aluminum frame is inserted at the front to attach the mast foot and daggerboard, and at the stern to attach the rudder supports. All this can be assembled without tools, with Velcro straps. 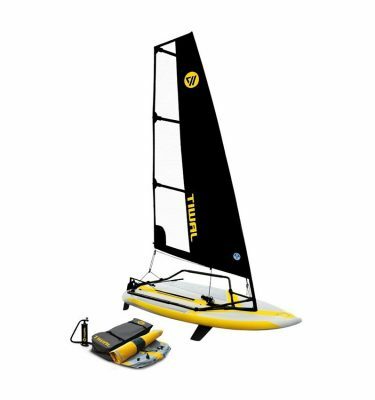 The Tiwal 2 sail is manufactured by North Sails, the world’s leading sailmaker. 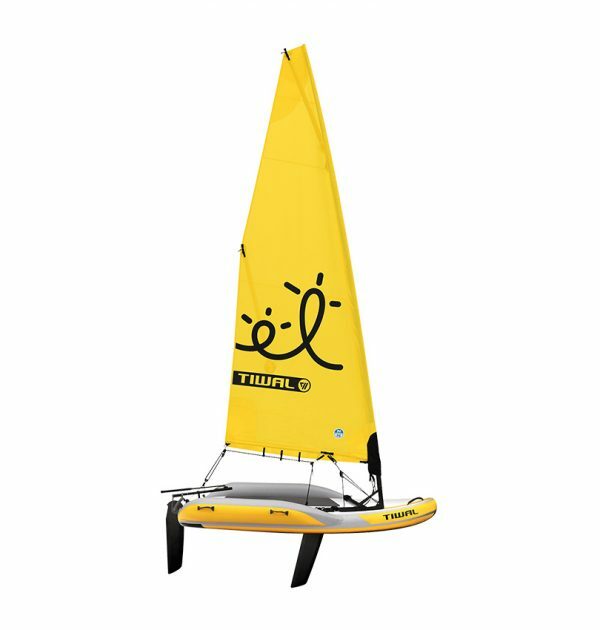 It is a versatile Dacron sail, with a surface area of 5.6m², which allows you to sail in varied wind conditions. It furls around the mast to make it easier to store. It is boomless for better safety on board and is equipped with battens that give it its power. Thanks to its sleeve it slides onto the 4.90m C50 carbon mast. The mast is in five sections and stows in the same bag as the hull. Assembling a Tiwal 2 is child’s play. There’s a minimal number of components to put together. Start by unrolling the hull. Thanks to the rechargeable electric inflator (included), most of the volume is effortlessly filled. Add on and clip together the three elements of the mast base and rudder support. Then complete the inflation manually to add pressure. Then there’s just the rudder and the daggerboard to be installed. Then switch to the rigging. The C50 carbon mast is made up of 5 sleeved sections. Simply insert the five parts one after the other into the sheath of the sail. Then furl the sail around the mast for easier handling. Place the mast on the mast base. Finally, attach the cunningham and the boom vang to secure the rig to the hull. Your Tiwal 2 is ready! All in 15 minutes and with no tools. What about disassembly? The same, but in reverse order, and just as quick.